In the world, where technology rules, text has become an almost outdated method to convey your ideas to others, in spite of the fact that some books continue to be influencing people regardless all these developments. On the other hand, your answer for effective persuasion lies in something that majority has always preferred over text — Visual. It is simple enough to understand, because most of us depend upon visual memory to remember things quickly. That is why infographics, presentations and videos, more often than not, become more popular than articles. Nevertheless, for a normal user, who does not have expertise in design, creating an effective infographic, banners, product demos and presentations is a tough task. However, Visme is all set to remove this tough label by introducing an all-new way to create visual treat and serve it to your customers, readers and public. In this review, we will explore Visme in such a way that you will understand why you should use Visme to create these visual treats by avoiding other solutions as Microsoft PowerPoint or Adobe Illustrator. First, we will have an introduction to Visme! Simply put, Visme is a web-based solution to create visual content like slideshow presentations, infographics, banner and product demos. Best part of Visme is that you can not only create awesome, creative stuff but also embed these visual contents in your website or blog, by just placing an iframe HTML code. Yet, Visme does not seem to be typical, web-based PowerPoint or Illustrator alternative either. To understand uniqueness and effectiveness of Vesme, you’d have to check out each task you can accomplish using this web-based solution as well as how its features make them easier. Now, we will have a look on different sections of Visme. Well, you can find a number of web-based alternatives for Microsoft PowerPoint, but Visme different from them in a variety of ways. 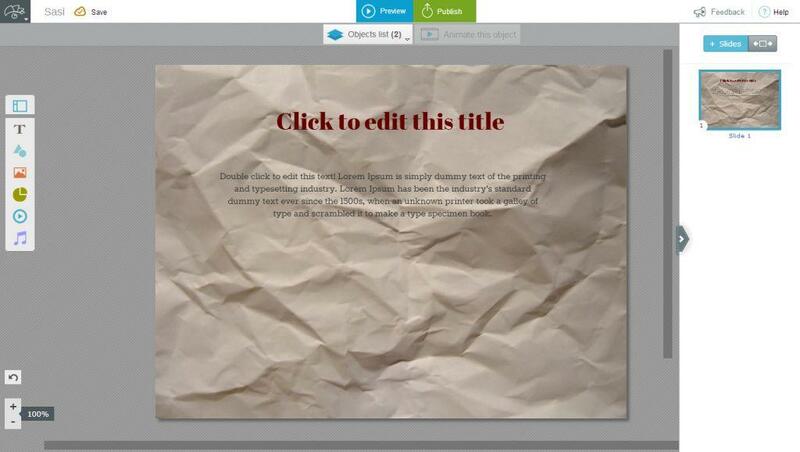 First thing, we noticed is that user interface of Visme Presentation creator is simple enough to learn. 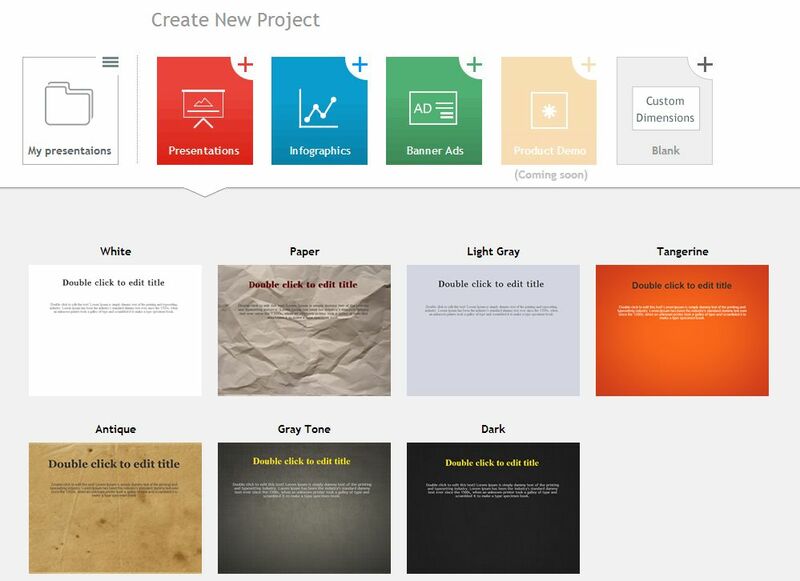 As you do in case of other content, you can select a template, and Visme has a ton of templates for you! 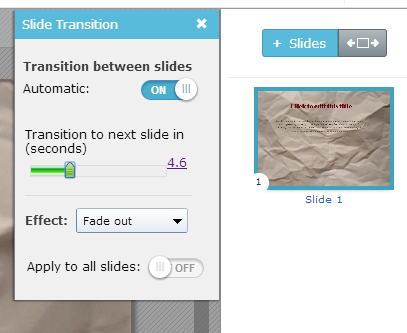 Once you’ve selected a template, you can see the fully-fledged presentation creation section of Visme, which will look like image that follows. You can manage content of each slide as if you are doing the same in Microsoft PowerPoint but there are a number of features that differentiate Visme from PowerPoint. For instance, when you want to add some images to the slides, you can use the integrated search engine to find free images. Also, there is a collection of wonderful vector sets that does make enough sense. Similarly, just as you do in Microsoft PowerPoint, you have the freedom to apply animations to objects and slides in a way that the presentation would be interactive. 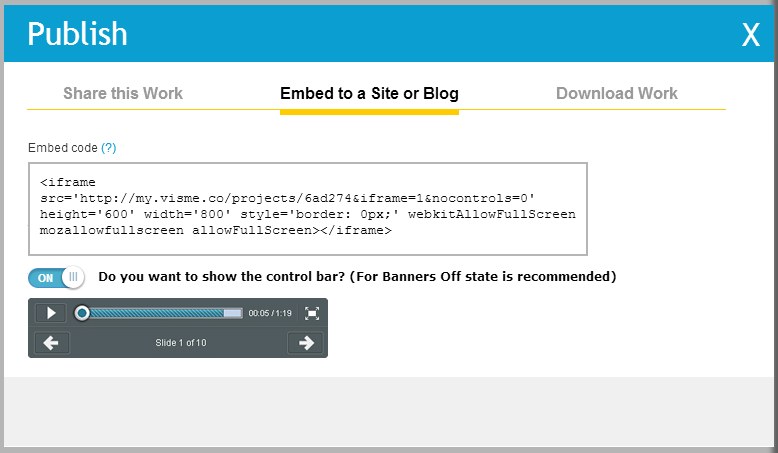 Once you have finished creating your slideshow, you can embed it in your site by pasting the code. Infographic creation is, perhaps, the most useful solution from Visme, because as of now, creating an infographic is a task that requires deep knowledge in designing. 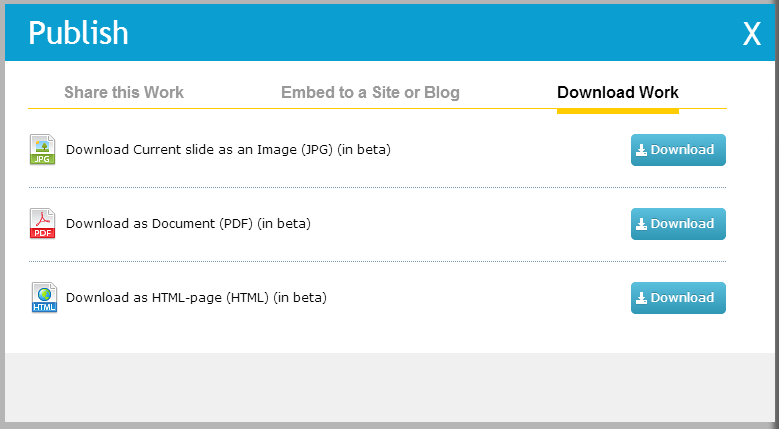 Using Visme, however, the process can be done in 4 steps — select a template, manage elements according to your requirement, preview the infographic and publish it in your site or get it as an image or PDF. 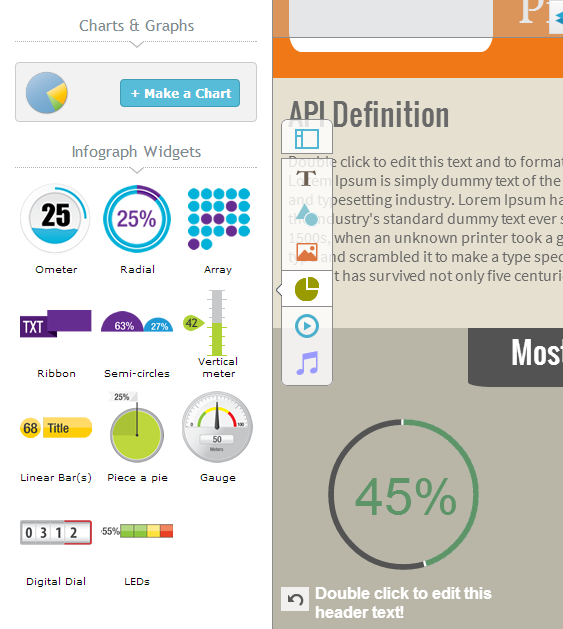 Resembling the case of presentations, Infographics section of Visme consists of different templates to choose from. Also, you have a huge collection of interactive elements such as charts, graphs. Thus, it does not matter whether you have experience in creating infographic, but you can create awesome infographics using Visme. In addition, rather than a static infographics, Visme can bring you an infographic, as you can add animations to every object you add to the infographics. Altogether, it’s just awesome. 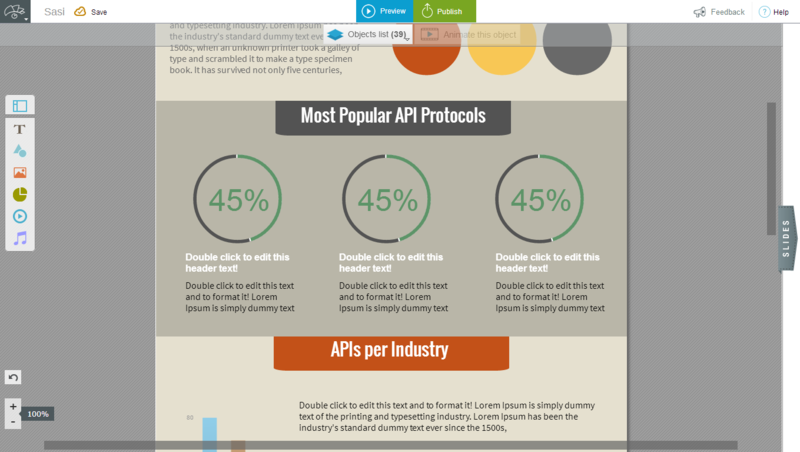 So, the next time, when you want to create a good infographic, do not search for a designer but just log on to Visme. Almost every web-based professional will find this section of Visme to be extraordinarily useful or essential. 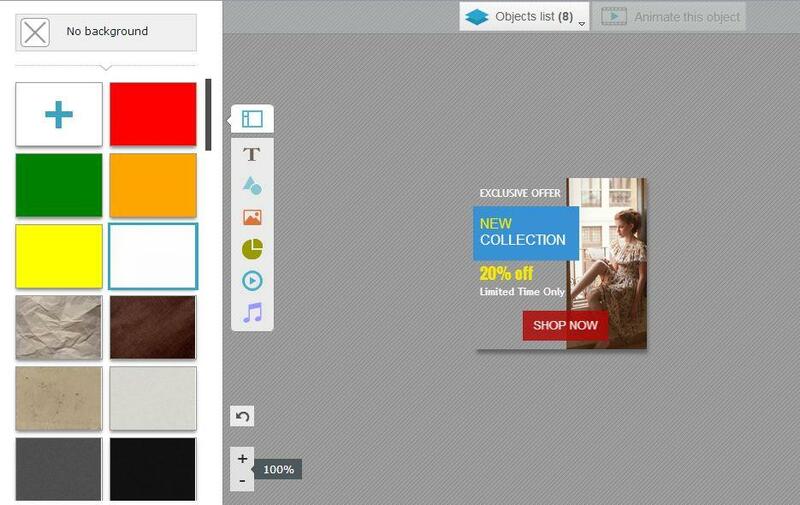 This part of Visme can be used to create stunning banner ads, in different sizes, using either your own style or from templates that are available in Visme collection. Since you can use this banner in your site by pasting iframe code, you can insert animations to your banner as well. It is a noteworthy feature, because your banner ads will become more interactive. 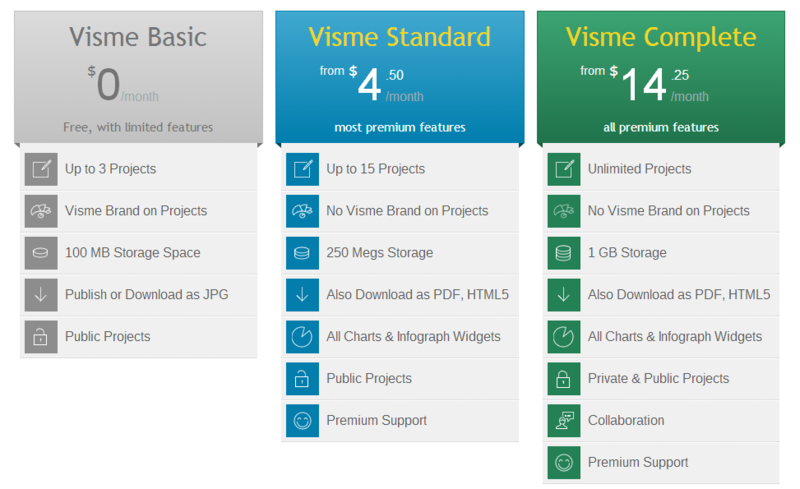 Nevertheless, if you want to get the banner in HTML5 or PDF form, you will have to subscribe premium plan of Visme. This is where Visme becomes entirely different from Adobe Illustrator or Microsoft PowerPoint. Visme offers 3 ways to publish or use your content. First, you can share your project with anyone on web using the unique URL. There is also an option to protect your work using a password. 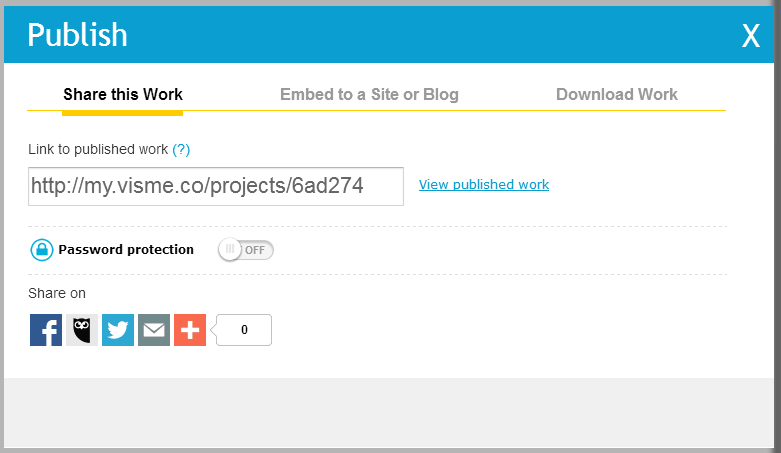 In the next section, you can embed your project in a website or blog. To do so, you have to just paste the code in the desired place. 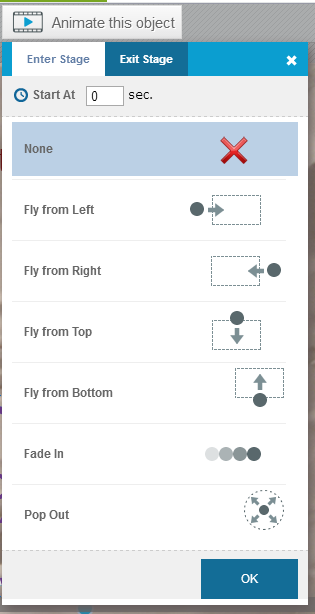 Also, there is an option to choose control panel. In third section, you can download your work for later use. You can download your project as image, as document or as HTML-page. These three options are, however, in their beta stage, though you can use it. Here comes, perhaps, the most impressive fact about Visme — its free availability, despite the fact that it doesn’t put that much limits; however, there are minor limitations in free version of Visme. For instance, you cannot download your project as HTML5 webpage, unless you have subscribed to the standard plan. On the other hand, when the Complete plan is with you, you will get 1GB storage and collaboration features along with premium support. Visme Standard and Complete plans cost $4.50 and $14.25 per month respectively. User Interface of Visme in used in every page is something great, indeed. Regardless your experience, you can make these banners, infographics and presentations with ease and with optimum effectiveness. So, we will give ten out of ten for its User Interface. We are really impressed by Visme, a solution that is aimed to transform the way we look into infographics, banners and other visual content. Particularly, we loved its UI, huge collection of templates and vectors, and plenty of tutorial videos and articles that are available in Web. Altogether, for a web-based professional and business, Visme is must!